VBA Security in Excel - ANALYSISTABS - Innovating Awesome Tools for Data Analysis! It is important to understand the macro or VBA Security in Excel if you are dealing with the Macro Enabled Files. It helps to protect your data from the malicious programs and helps to know how to run the macros when its required. 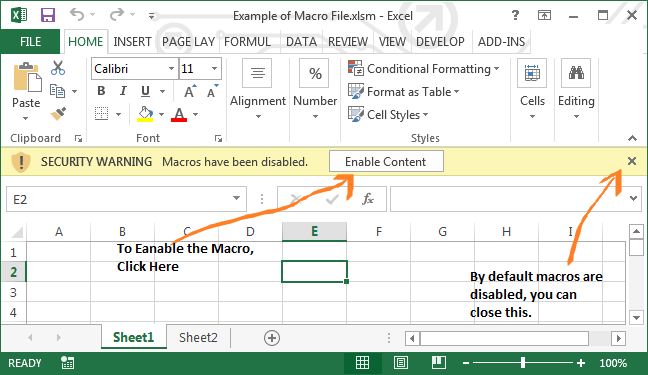 You can change the security level by clicking on the ‘Macro Security’ button in the ‘Developer’ Tab of the Excel Ribbon. What Have Different Levels of the Security in VBA? Disable all macros without notification All macros will be disabled. Disable all macros with notification When you open a file all the macros will be disabled, but it will be prompted with a message allowing you to enable them each time. This is the recommended option, since you can if you trust the macro file. Disable all macros except digitally signed macros You won’t be able to run any macros unless they have a trusted digital certificate attached. When you open any macro enabled file, if you have chosen the option “Disable all macros with notification” in the Macro Security Settings. It will prompt for enabling or disabling the macros. If you trust the file you can Enable it or else disable the file. Step 1: Open the Visual Basic Editor (Alt+F11). Step 2: Select “VBAProject Properties” in the “Tool” menu within the Visual Basic Editor. Step 4: Select the “Lock Project for Viewing” check box. If you don’t check this box, it won’t hide your code. Step 6: You are Done! Save, Close, and Reopen your workbook for the protection to take effect.